Welcome to the website for Andrea Joy Smith, DDS of Sacramento, CA. Dr. Smith is a qualified and reputed mini implant dentist with special interest in restorative and cosmetic dentistry. Not only is she well known for offering complete and thorough periodontal and endodontic treatments, she is also capable of performing complicated full mouth restoration procedures. Whether you want to replace a missing, broken or cracked teeth with mini dental implants, need more specialized treatments such as a root canal, or wish to enhance your looks with cosmetic treatments like teeth whitening or gum contouring, Andrea Joy Smith, DDS’s dental practice is your one stop destination. Dr. Smith offers a wide range of restorative dental care treatments replacing missing teeth with dentures, dental crowns as well as dental implants. She is also trained t in periodontal and endodontic procedures like root canals, periodontal scaling, and root planning using Diode laser technology. Andrea Joy Smith, DDS also offers specialized treatment plans for children and the elderly. If you are looking for comprehensive dental care and treatment for your whole family then Dr. Smith is definitely your best option. Before setting up practice in Sacramento, CA, Dr. Smith completed her training at the University of California San Francisco School of Dentistry. Many years of experience handling unique and complicated procedures at this prestigious facility, has made Dr. Smith uniquely suited to take care of all your dental problems. Whether you are searching for a dentist for yourself, or for your entire family, Andrea Joy Smith, DDS provides complete dental treatments for each and every one of his patients. No matter what your problem may be, you will be treated with utmost care and importance. Dr. Smith understands that oral and dental care is about more than healthy teeth, it is about a healthier you. While you remain a patient with Dr. Smith, she will help both you and your family maintain the highest standards of oral and dental health. Restore your naturally beautiful smile today with Andrea Joy Smith, DDS. At Andrea Joy Smith, DDS rest assured that you’ll receive the personalized attention you deserve. Our dental experts will listen to your needs and answer all you questions. You will receive a complete and thorough exam, including oral cancer and gum disease exams, at no additional charge. Plus you’ll enjoy our friendly, caring team. 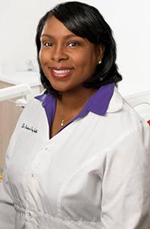 Let Andrea Joy Smith, DDS in Sacramento, CA be a part of your ongoing commitment to your dental health. Dr. Andrea Joy Smith was raised in southern California. She completed her primary and secondary education in the Los Angeles area. She received a Bachelor of Arts Degree in Psychology from the University of California Los Angeles (UCLA). After being accepted into the University of California San Francisco (UCSF), School of Dentistry she relocated to San Francisco. Receiving two degrees from UCSF, Bachelor of Science Dental Sciences and Doctor of Dental Surgery in 1994, Dr. Smith began to practice dentistry. She first practiced at a Bay Area public dental clinic. One year later, she established St. Joseph Family Dental Care with a dental school classmate, where she practiced until 1999. In 1999, Dr. Smith and her family moved to th Sacramento area. She welcomed the opportunity to serve the Sacramento community, City of Carmichael, in November 2000. Dr. Smith has been practicing dentistry for over 16 years.